Mix butter, bread crumbs, eggs, parsley and lemon juice. In the worn steel pan with black handle, my Mom would boil the water for the asparagus. Curiously, there were always 2 lone eggs in the pan while the water was coming up to a boil, that were then joined by the asparagus. 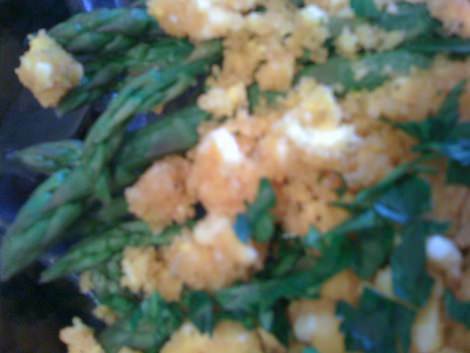 I was always fascinated by the eggs and asparagus, rolling around in the pan together. Still am ☺ . I now know how clever my Mom was to complete 2 tasks at once and save herself from needing to wash another pan. This can be done ahead. Just make sure if you refrigerate it, you either bring it to room temperature before your broil it or make it in a fridge to oven pan.